You may recognize this Danish group’s songs before you know who is performing them. 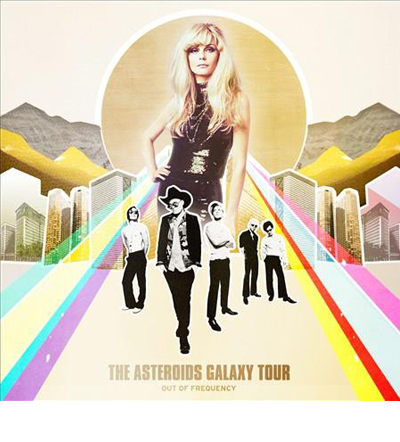 The Asteroids Galaxy Tour’s “Around The Bend” has blasted repeatedly on iPod Touch commercials, and their music has turned up on television programs such as Mad Men. On their second album, Out Of Frequency, The Asteroids Galaxy Tour’s squeaky-voiced, arms-in-the-air combination of ‘60s pseudo psychedelia, indie immediacy, and big band brassiness pervades. Vocalist Mette Lindberg’s flowing locks are the physical embodiment of the group’s sound, which on tracks such as “Heart Attack” is at its fizzy, bubble pop, ebullient height. Solidifying the physical with the aural, Lindberg’s layered frocks match the many layers in Asteroids’ music. Case in point, on “Ghost On My Head” horn honks, handclaps, and massive percussion are in perfect matching band harmony. Producer and songwriter Lars Iversen hits his effervescent peak on “Fantasy Friend Forever” where organ swirls top off what is already a stew chockfull of funk flavor. Our Of Frequency dares you not to move.